Chickpea garbanzo bean dip goes splendidly at any party. Chickpea garbanzo bean dip or hummus is a delicious vegetable protein rich dip that is easy to make but needs a little aforethought. Known as choumi to the Greeks, and hummus to the rest of the world, this simple mixture of legumes, sesame seeds and other bits and pieces is super delicious. It's definitely not a last minute dish unless you use the canned legumes at four times the price. Yet it doesn't take much time to prepare; only four minutes to make. But first, they need to be soaked at least overnight and preferably longer, and then boiled in a pressure cooker for half an hour. Are you starving at 11am? Do you suffer from constipation, heart problems and high cholesterol? Chickpea dishes are for you. Research shows those who enjoy this garbanzo bean dip are much less likely to snack, feel constantly peckish and actually eat less overall. The garbanzo bean or chickpea is the world's favourite legume and for good reason. Neither a bean, nor a pea, more garbanzos are eaten than either the common green bean or the garden pea. It's delicious if you add some goodies and rich in vegetable protein, particularly tryptophan, an essential amino acid, used for example in the body to manufacture melatonin; it helps you sleep better. Chickpea burgers ... much nicer than soy burgers. In the subcontinent, chickpeas are known as white channa. There, of course, rather than tahini, the Indians prefer other spices like ground coriander, turmeric and garam masala. With fresh tomatoes, it's called Channa Masala; google it. Your chickpea garbanzo bean dip is the second most potent natural food to lower cholesterol; if you're tired of those nasty side effects of statins, like restless legs and impotence, then it's time to start making your own hummus. Once you have the ingredients at hand, it takes less than five minutes. Get off statins safely starting today. 1 cup dry Chickpeas / aka Garbanzo beans. One clove of garlic, more if your friends and family don't mind! A couple tablespoons Olive Oil, be generous. A few slices of peeled lemon. A little of the finally chopped rind is also nice. Or, half lemon, half orange. And a few slices of any other fruit. A good pinch of Salt, and freshly ground black pepper. Update: Half a cup of water or yoghurt, is my variation; I prefer it less thick with a salad. If you like it creamy and moist add a couple tablespoons of water rather than more oil or yoghurt. Growing lemon trees is not difficult. How to make tahini for your chickpea garbanzo bean dip is only for those who don't have access to a Middle Eastern supermarket. If you have no Greek, Turkish or Lebanese shops in your area, you may have difficulty getting tahini. I can now make my own, but somehow it's not quite up to the perfectly roasted paste from the Middle East; they've been making it for thousands of years, and to date I haven't matched it. What is Cumin? It's far nicer home roasted and ground than the powdered stuff you'll buy in the supermarket that is soon ancient and almost valueless; don't tell the spice people I said so! PS. I'm making this delic hummus as I type! I want it to go with our salad. Last night, I put the chickpeas in plenty of water to soak. Plenty. Method 1: Cooking chickpeas using a pressure cooker; add plenty of water. Thirty minutes. This morning, just before I left for the Chiropractic Coalface I brought them to the boil for ten minutes. When I arrived home this evening, I pitched out the liquid (don't pour it onto your potted plants as one patient was doing - it has a growth inhibitor!). Swill the peas out a few times with fresh water and then put them on to boil until tender. About an hour and a half in a normal pot. They must be tender or they'll give you a bellyache. When cooked, drop the cloves of garlic into the boiling mixture after you have turned the heat off. It takes the bite off the garlic and they are less likely to cause heartburn. Tip off and discard the liquid and again rinse a few times with fresh water. SAVE THE PLANET: Grains like rice, lentils (what's that? Lentil protein ...) and dried Garbanzo beans for your Chickpea Garbanzo Bean dip don't need a full two hours of cooking. The pressure cooker is a wonder. Don't buy aluminium. There are still questions about the metal and Alzheimer's disease. Solar pressure cooking with or without the sun. But first a little update on this page. Preparing your hummus leaves quite a big carbon footprint; it takes a lot of energy to prepare them. So, if you are crazy about the nutritional values of our dip like I am, soak and pressure cook a couple pounds and you'll find freezing chickpeas a breeze. 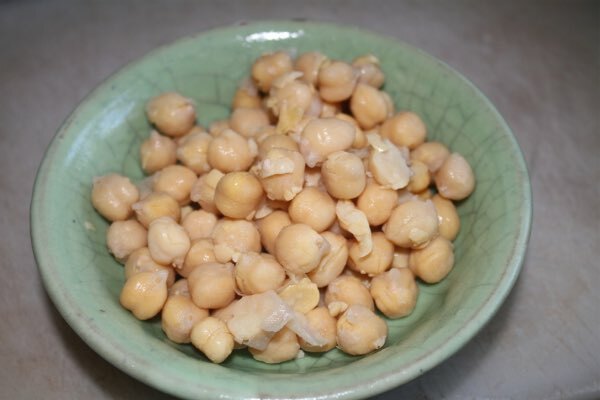 Soaking overnight with a squeeze of lemon juice, and rinsing several times also negates the effects of phytates that bind the minerals in your chickpeas. In the same vein when you are boiling an egg pour only a smiggin of water in the pot, bring to the boil and, immediately it's steaming hard, switch off. In ten minutes you have your soft boiled egg. They very rarely crack if you use just a little water; no more than 5mm deep. Perhaps roll it around once or twice. Leave it boiling for two minutes longer, and you'll have a hard boiled egg. Apart from being a very rich source of vegetable protein, this chickpea garbanzo bean dip stays with you for the whole day, so you don't get hungry two hours later; they are loaded with the soluble fibre that gives you a happy tummy. That's the stuff that deals effectively with constipation but also leaves one more satisfied after a meal. There's lots of research that proves that garbanzo beans, and in fact all legumes, drastically reduce the bad cholesterol in your blood (LDLs). The joy of foods like our CHICKPEA GARBANZO BEAN DIP, APPLE SALAD RECIPE and PICKLED BEETS is that you can enjoy more butter instead of that horrid, unhealthy margarine (hydrogenated foods), and still keep your cholesterol within normal limits. How do I know? I eat plenty of butter - more than is good, I admit - but my blood cholesterol LDL is dangerously low! Hydrogenated foods like margarine ... why are they so bad? Suffering from generalised muscle weakness? Chickpeas are also rich in thiamine. A diet based on refined white rice causes beri beri. Tired all the time syndrome; chickpeas are a rich source of iron. Whilst the Garbanzos are boiling, I get on with the preparation of the Olive Garden Salad Recipe; make it in a jiffy. Then you will be ready to spoon the scrumptious chickpea garbanzo bean dip onto your salad, garnish with a few olives and Bob's your uncle, you have the perfect salmagundi. Add a sliced boiled egg if you like, or smoked salmon; there's enough soluble fibre here to keep your blood cholesterol in good shape. Incidentally, Americans and probably Europeans too on average consume less than 50% of the recommended choline; it's a B vitamin intimately involved in the methylation of highly inflammatory homocysteine, a breakdown product of protein metabolism. There's some in your chickpea garbanzo bean dip, but much more in eggs; they are the richest source; we avoid them at our peril. Even the American Heart Association agrees. A deficiency causes birth defects too. Every kitchen needs a stick blender, if only to blend your hummus; it's a gem for making soups too. Tip the garbanzos and the parboiled garlic clove into the liquider, or alternatively roast the garlic with a littl olive oil in the oven for ten minutes. and the half Lemon, pulp and all, and the salt and some fresh black pepper. You guessed it. Liquidise. Mm, it's a bit thick, the blender is taking strain. More olive oil, or a bit of yoghurt perhaps for a change? Update: been adding more yoghurt - it definitely improves the humus. These days I'm adding a couple tablespoons of water. The honest truth is that plain hummus (chickpea garbanzo bean dip) is rather boring. It has very little taste. You eat it because it's good for you. But... you can make it delicious, to your own particular fancy. 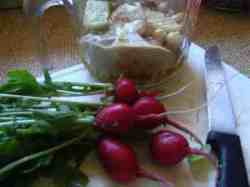 I like to add radishes from the garden, or celery, or some chili, or a sweet fruit like mango. Experimentation is the keyword. How to grow radishes … easy as falling off a bus! I eat hummus every single day. Literally. On bread, with a salad, on a biscuit, even with my breakfast cereal; it does not last more than three days, so the balance goes to lowering the GI of our vegan seed bread recipe; that's done by adding some fat as in olive oil and protein. Are you looking for some short cuts? Try this quick hummus recipe. Part of the secret is a pressure cooker. It makes cooking chickpeas a lot easier and quicker. Authentic hummus recipe frankly is a bit of a hoax as you can add just about anything, and everything to this slightly different chickpea garbanzo bean dip. But the basics remain; chickpeas, olive oil, cumin, garlic, tahini and parsley. Right now mangoes are in season, and jalapenos, so I add both; it's wonderful. To be honest chickpeas are a little dull and any dish needs to be livened up. 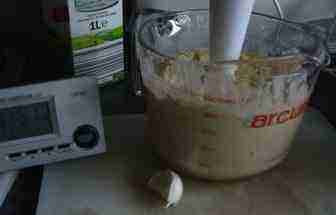 Authentic hummus recipe ... more ideas about Hummus. "She who must be obeyed" tells me that the Salmon and Broccoli soup is ready, and by the time we're finished the first two courses the Chicken Curry will be done. They spend their living dying. The pulp of lemon and orange contains much of the goodies; when making your chickpea garbanzo bean dip, use the whole fruit. Whilst I confess I haven't made the same comparison with a lemon, an investigation of ORANGE JUICE FACTS reveals that there is an enormous difference between using the whole orange, pulp and all, and only the juice. OJ from a carton has minimal vitamin C, folate, magnesium, calcium... and all the other goodies are deficient. Rather use the whole fruit when making your chickpea garbanzo bean dip (hummus). Eat whole oranges and apples, and avoid the high Glycemic Index fruit juices. They stress your pancreas and increase the insulin output, the hormone that turns blood sugar to FAT! 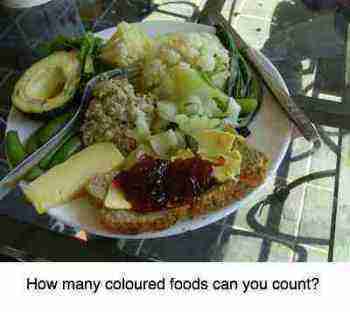 Do we always eat like this? Nearly, certainly three nights a week. But the helpings of soup and chicken curry are very small. And the salad is enormous! In any case you won't get fat eating huge scoops of chickpea garbanzo bean dip on a giant salad; obesity isn't a problem with food like this. It's all about balance. Eat plenty of fruit, salad and our Chickpea Garbanzo Bean dip, and you can enjoy some dairy without guilt. I do, and my cholesterol is fine. Oh, and of course, tomorrow's lunch sandwiches always include a slice of bread smeared generously with hummus, and a couple slithers of tomato and, if you have it in the garden, a few leaves of fresh sweet basil. In fact, I've taken to adding a generous tablespoon to my cereal in the morning. Then I don't get ravenous at the CHIROPRACTIC COALFACE 2 at 11am! TIP: Hummus tastes great with fruit other than lemon too. I make hummus regularly, and we eat it EVERY day, that's one of the reasons my cholesterol is 4,2 (about 160 I believe in American figures) and this time I used a whole orange instead of lemon. Last time it was a peach, that's still my favourite. Nope: grapes are now my family's favourite in my CHICKPEA GARBANZO BEAN DIP! It's not rocket science: Double the fibre in your diet and you decrease the risk of heart disease by a half. Got a bit of space in the veggie garden? Think about growing chickpeas, your very own, but only if you live in hot summer area, with low summer rainfall, like California. 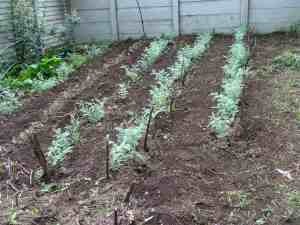 They have a long growing season, and frankly whilst I grew a few for green chickpeas, they are a pain to reap. Green or dried, for your chickpea garbanzo bean dip, they are delic and healthy. Cooking green beans is something that even the dumbest male can learn to do! After all, I can do it! What's more in fifteen minutes from start to finish. I call it Slow Food Made Fast. Eight weeks to grow them, five minutes to pick them, three minutes to top 'n tail, and two minutes to cook after they've come to the boil. A favourite lunch is a green bean salad with a scoop of your chickpea garbanzo bean dip. The bean, full of protein and healthy carbohydrate, a wonder food, full stop...... delic, healthy, very low glycemic index, low in calories, full of anti-oxidants, rich in folate and vitamin B6 to prevent homocysteine build up, what more do you want?!!! Growing green beans is even easier than cooking them. Unless you choose to plant the bush bean variety, then I strongly recommend you do your chiropractic help Lower back exercises ... demonstrated here on YouTube. Otherwise you're likely to be disgruntled with a Lumbar disc protrusion and decide that frozen green beans are lot cheaper! Not half as nice and healthy though, and besides which you'll miss out on seeing those fairies at the bottom of the garden! Update: I've changed my tune rather; for the last three years our green beans were destroyed by the Mexican bean beetle; refusing to spray we were at a loss. The introduction of free range hens into our garden has supplied the unexpected solution; they love the Mexican bean beetle larvae it would seem. Why on a Chiropractic Help site? There is so much evidence now that a healthy spine, bones, cartilage, discs is not only dependent on reducing subluxations that cause the immobilisation arthritis that afflicts so many folk. Your spine also needs healthy nutrition to repair and be strong. So chiropractors from of old have been intensely interested in exercise and good nutrition. And anyway, what's the point of a healthy subluxation-free spine, if you are deficient in magnesium, and have a heart attack and die? Where are you going to live if you don't look after the bod? Our hummus, Chickpea Garbanzo Bean dip is loaded with magnesium and lot of other goodness. Think Chiropractic Help, think exercise, read more from our healthy living tips. Dips made with Cream Cheese; or Feta.